The fireplace and mantle are right up there when talking about creating a focal point in any room; especially the bedroom! In the bedroom it adds glamour and resale value,instantly. And that's not a bad place to start because you have an instant feature, mood creator and a warm coziness factor. 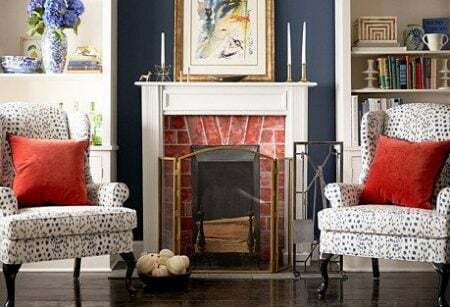 With so many great fireplace ideas out there from the latest Airstone which is lighter and cheaper than stone, unfinished wood, stone, antique or brick, including all the additional bling to go with it, here are a few ideas you can add to your home decor toolbox. This post has lots of ideas from creating and decorating your fireplace, from gel to gas, glass doors and more. 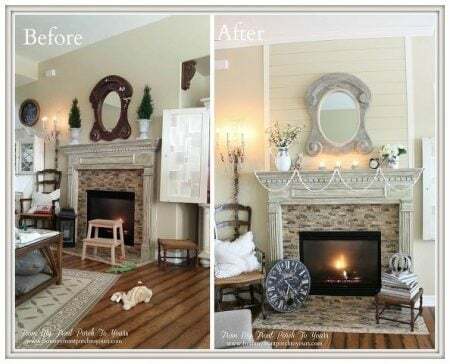 It's a long post, but there is bound to be an idea or two you can borrow to add a fireplace to your rooms or make your existing fireplace look amazing. 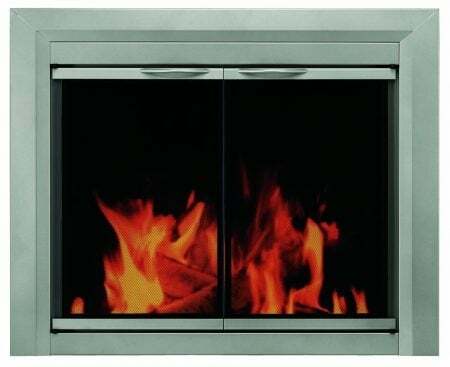 Glass doors were invented to stop drafts coming down a chimney once the fire goes out. They have evolved from a functional to a decorative accessory. Easy if all you need is a firescreen. There are so many wonderful styles to choose from. 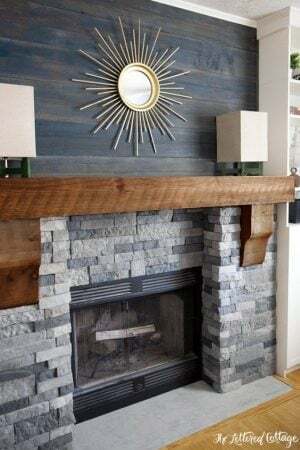 If you have a fireplace already installed; the good news is that they are a fairly simple DIY project and only take about 30 minutes or so to install. The type of doors you need, depends on the fireplace you have. 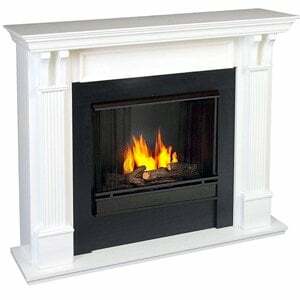 A masonry fireplace has a brick firebox and chimney; which creates its own built in cooling and ventilation. an overlap. An overlap door fits outside the firebox. inside fit. An inside fit doors sit flush with the fireplace. Installation requires a masonry drill bit and anchor screw to mounting the door in your fireplace. Factory (prefab) fireplace has a chimney and metal firebox. To deal with the amount of heat they generate, they require full ventilation for cooling and safety. In some cases, these are ready for doors to be easily popped into a track. Once you have determined the design, you are ready to pick out your beautiful new set of glass doors. 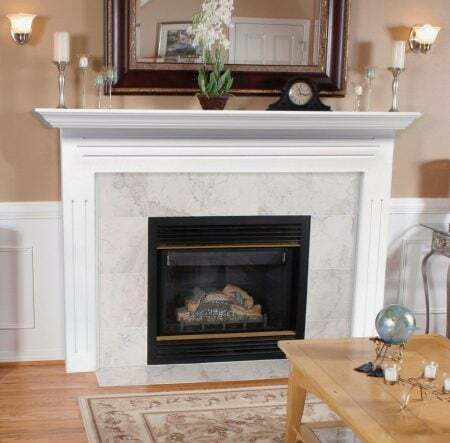 While there are a variety of styles to choose from, it is best to know your manufacturer and model number as well as the dimensions of your fireplace before placing the all or shopping online. If you are unsure of what to do, check out the links provided here. 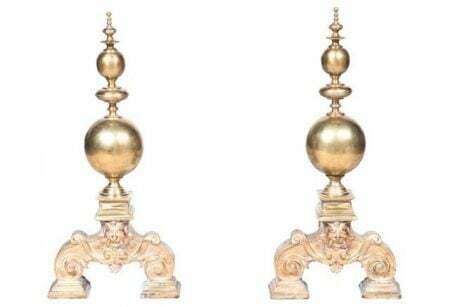 Consider your mantle like another piece of furniture; tall mantel for tall spaces and smaller mantel for instant intimacy and great for smaller rooms. If you are using it more as a decorative prop, then filling the empty hole can become as deep as your imagination, to create a feature focal point in your room. 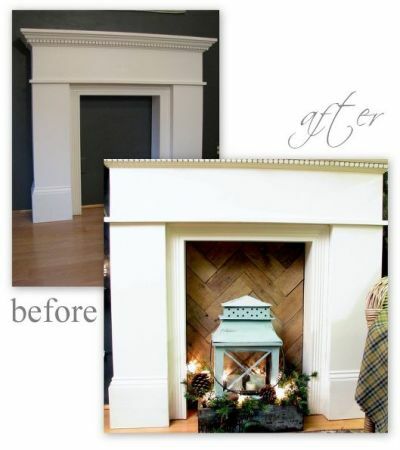 One way to fill your fake fireplace is with a chalkboard or styled wood pieces, like a herringbone pattern. Both are a perfect backdrop for any seasonal decorating you might like to add... and very easy to decorate. Use thin slats of wood from a pallet board. Stack the cut pieces, cutting about six at a time with a chop saw to straighten. Creating a herringbone pattern isn't too difficult, once you lay your pieces down on a board. Hot glue your wood pieces to plywood, starting from the center of a plywood board, the same size as your fireplace. Once completed, trim excess pieces with a jig saw. Slip the completed board into the space. Same idea, but different shape, is another look. This idea from Pepper Design Blog, uses 50 -60 variously sized log slices, plywood cut to the shape of your opening, black matte paint, wood glue (or nail gun) . Simple when you know how. Chop your logs into 3″ slices to assemble your my faux stacked wood pile. Glue these to your backing which is measured, cut to size and painted black. 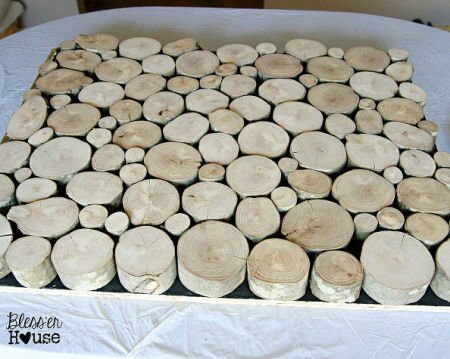 You can either use a nail gun to secure the slices to the backing and to keep the logs from moving or add a thin coat of wood glue to each piece and allow to dry overnight. 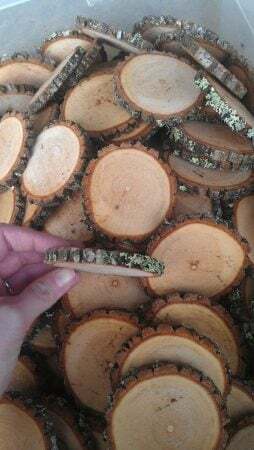 If you don't want to cut your own; here is a cheap way to cheat using a variety of different size Sourwood tree logs! are available. Mix them up or keep them all the same. Its up to you. 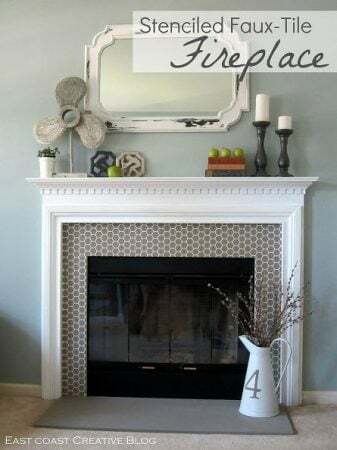 Next here is a stenciled faux tile fireplace. Create this faux tiled look using a stencil and chalk paint. 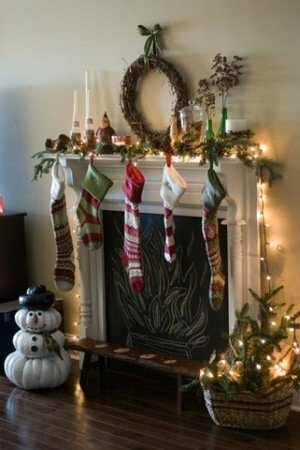 If the problem you are having is above your mantel, not below it, then maybe this idea could help. The cost is about $100 using a sheet of birch plywood (1/4 " thick) but it adds a great finish to your fireplace. Cut the plywood into 5ft long by 5 " wide strips. You may need to add crown molding to the top of your room. If you do, add this first. Then start adding your planks. Space out each plank using pennies. Attach each plank with a nail gun. Fill in any holes, sand and vacuum. Add trim to the sides to finish off the look. Paint. This is a great back drop for any room, and a feature in itself. What if you don't have a fireplace in your room? Make one! 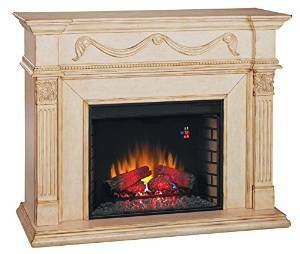 I'm talking about creating a fake fireplace to get the decorating benefits with a wood frame like the one below, from Ana White. 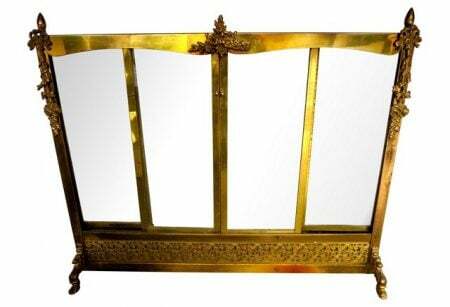 At less than 6" deep, it won't take over your bed room but it will create a great focal point. At a cost of between $20- $50, in a farmhouse style, this is a great DIY starter. It is also designed to be freestanding; that means it can live in the attic or basement if you want a change. 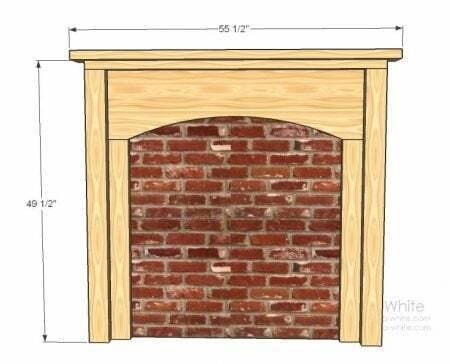 Ana White has used fake bricks to line the center of her fire place, like the one below, but you can use anything; painted sheeting, chalk board, wood. This is what you need to create this - and in just a few hours too! You can adjust the design if you feel confident. Cut the header into an arch shape. Screw your inner trim to the arched top. The joint will also be reinforced from the back and sides. Add the 4×4 posts to the frame. Add another 'top'. to create your top shelf again using 3″ screws. Finish by filling holes with wood filler, sanding, and then priming everything but the top. Screw through the 2×12 header into a stud in the wall behind the faux fireplace to keep it from tipping forward. 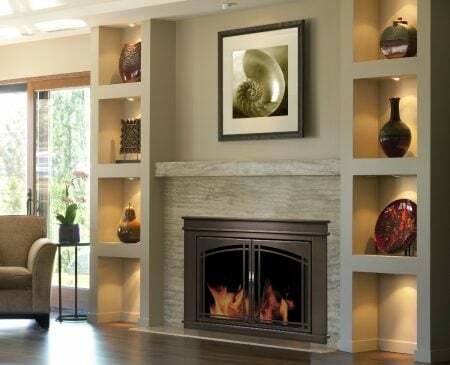 Popular Mechanics senior editor Roy Berendsohn says the big advantage of these fire places is that they don't require a flue, so you can put them nearly anywhere in the house. In some cases, you can also retrofit an existing fireplace so that it will burn gel or liquid alcohol. The downside is that unvented combustion; be it from a gas kitchen range, a gas-fired ventless fireplace, or even candles, releases pollutants­ and particles into the indoor air. 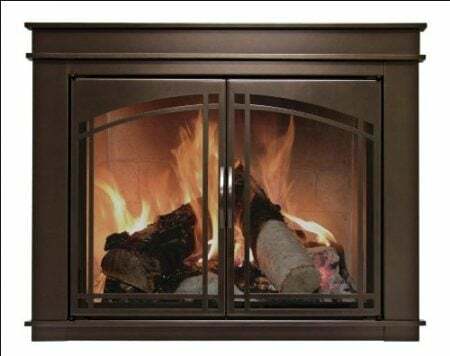 If you're not counting on your fire place to provide heat; you can use the look of a gel-alcohol fireplace to give you the hypnotic flame of a wood fire without the dirt. These appliances are pretty simple. They are basically a steel box with a ceramic log set. They burn gelled alcohol in a can. There are also liquid-alcohol fireplaces, many of which have no log set. 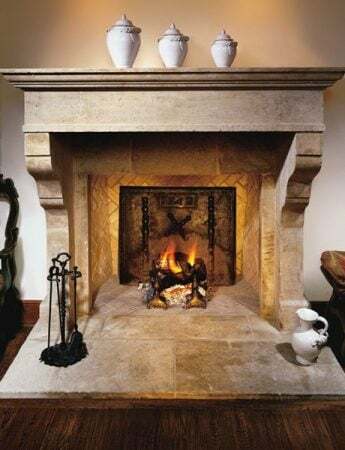 The big advantage of these fireplaces is that they don't require a flue; so they can fit almost anywhere in the house. 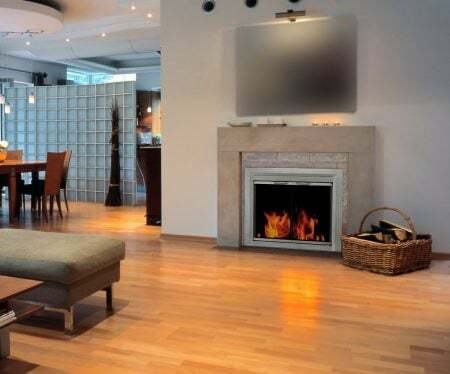 In some cases, you can also retrofit an existing fireplace to burn gel or liquid alcohol. For those who have indoor fire places covered, you can find outdoor mantel ideas here! If you have a DIY fireplace idea.. send it in!